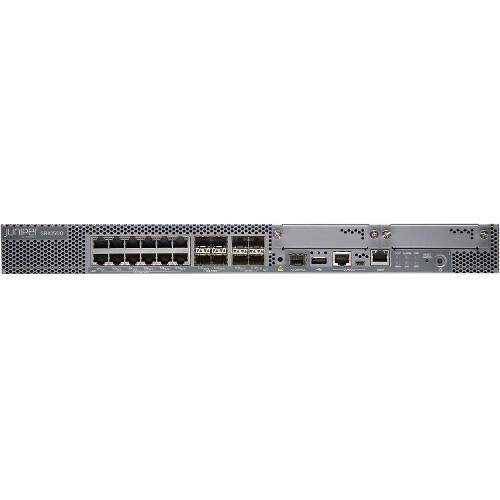 The Juniper Networks® SRX1500 Services Gateway is a high-performance next-generation firewall and security services gateway that protects mission-critical enterprise campuses, regional headquarters, and data center networks. The SRX1500 is the only product in its class that not only provides best-in-class security and threat mitigation capabilities, but also integrates carrier-class routing and feature-rich switching in a single platform. The SRX1500 delivers a next-generation security solution that supports the changing needs of cloud-enabled enterprise networks. Whether rolling out new services in an enterprise campus, connecting to the cloud, complying with industry standards, or achieving operational efficiency, the SRX1500 helps organizations realize their business objectives while providing scalable, easy to manage, secure connectivity and advanced threat mitigation capabilities. The SRX1500 protects key corporate assets as a nextgeneration firewall, acts as an enforcement point for cloud-based security solutions, and provides application visibility and control to improve the user and application experience. A combination of new hardware and software architectures on the SRX1500 add significant performance improvements to a small 1 U form factor. The key to the SRX1500 hardware is the security flow accelerator, a programmable high-speed Layer 4 firewall chip, and a powerful x86-based security compute engine for advanced security services like application visibility, intrusion prevention, and threat mitigation capabilities. The SRX1500 software architecture leverages these programmable hardware components and virtualization to deliver high-speed firewall performance, application visibility, and intrusion prevention while lowering total cost of ownership (TCO). The SRX1500 is purpose-built to protect 10GbE network environments, consolidating multiple security services and networking functions in a highly available appliance. It supports up to 9 Gbps of firewall performance, 3 Gbps of intrusion prevention, and 4 Gbps of IPsec VPN in enterprise campus, regional headquarters, and data center deployments. The SRX1500 Services Gateway delivers a full complement of next-generation firewall capabilities that use advanced application identification and classification to enable greater visibility, enforcement, control, and protection over the network. It provides detailed analysis on application volume and usage, fine-grained application control policies to allow or deny traffic based on dynamic application name or group names, and prioritization of traffic based on application information and contexts. The SRX1500 recognizes more than 3,500 applications and nested applications in plaintext or SSL encrypted transactions. The SRX1500 also integrates with Microsoft Active Directory and combines user information with application data to provide network-wide application and user visibility and control.